Lincoln Log Cabin State Historic Site, part of the Abraham Lincoln National Heritage Area, preserves the 19th-century home of Thomas and Sarah Bush Lincoln, father and step-mother of our 16th president. Abraham Lincoln was a lawyer living in Springfield by the time his parents moved here, but his burgeoning law practice often brought him to Charleston and the farm, especially during the 1840s. Abraham Lincoln also owned a portion of the farm which he deeded back to his father and step-mother for their use during their lifetime. Today Lincoln Log Cabin is an 86-acre historic site that is owned and operated by the State of Illinois, managed by the Illinois Department of Natural Resources, Division of Historic Sites. The site includes an accurate reproduction of the Lincolns’ two-room cabin that was reconstructed on the original cabin site in 1935-1936 as a Civilian Conservation Corps (CCC) project. The National Park Service oversaw the creation of Lincoln Log Cabin State Park with CCC labor. The CCC camp, Camp Shiloh, was located within the park’s boundaries and its enrollees were WWI veterans. Today the ten acres in the northwest corner of the park where Camp Shiloh was located is listed on the National Register of Historic Places. 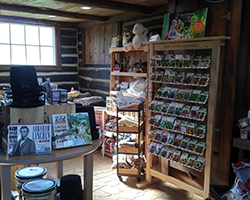 A working, living history farm has been developed around the cabin, and a second historic farmstead, that of Stephen and Nancy Sargent, has been moved to the site to help broaden visitors’ understanding both of life in the 19th century and Lincoln’s legal practice in the community. The site also includes the Moore Home, where Lincoln bid farewell to his family in 1861 before leaving to assume the Presidency, and the gravesites of Thomas and Sarah Lincoln at the Thomas Lincoln Cemetery. In commemoration of the 150th anniversary of the death of Sarah Bush Johnston Lincoln, a scholarly presentation on motherhood in the 19th century will be presented in the Visitor Center Auditorium on Saturday at 1 p.m., followed by a discussion of the genealogical research on the descendants of Sarah Lincoln. A reenactor portraying Mrs. Lincoln will also be receiving visitors to the Lincoln farm throughout the day. On Sunday at 1 p.m., observances conclude with a wreath laying and graveside remarks at Thomas Lincoln Cemetery. See Facebook for detailed schedule of events. Stop by the Goosenest Prairie Gift Shop for a souvenir!